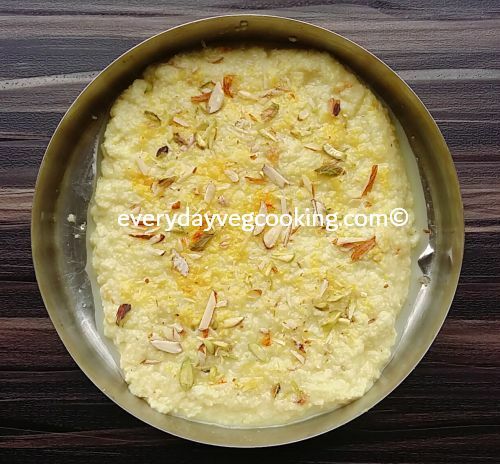 Kesar kalakand is a popular north Indian dessert. Its rich taste and texture make it a perfect dessert for special celebrations, family functions and festivals. It is also a perfect homemade dessert for fasting/vrat. The recipe is very easy and simple. It is made by combining reduced full-cream milk, crumbled paneer, milk powder and sugar. It is mildly flavoured with saffron and cardamom powder and garnished with nuts. Grease a plate with desi ghee. Finely slice almond and pistachios. Soak kesar in 1 tbsp warm milk and crush it. Make paneer from half litre milk. Crumble or grate the paneer. Heat milk in a heavy bottom kadhai on medium flame till it reduces to 1/3 . Keep stirring milk in between to prevent burning. Now add crumbled paneer and milk powder. Mix thoroughly. Cook on a medium flame until the mixture thickens. Keep stirring. Now add sugar, crushed kesar and cardamom powder. Mix well. Cook till the mixture combines together and starts to leave the sides of the kadhai. At this stage the mixture should look moist. It should not be very dry. Transfer the mixture to the greased plate and spread it evenly. Keep the thickness to ½ “. Sprinkle sliced nuts on the kalakand and lightly press with a spatula. 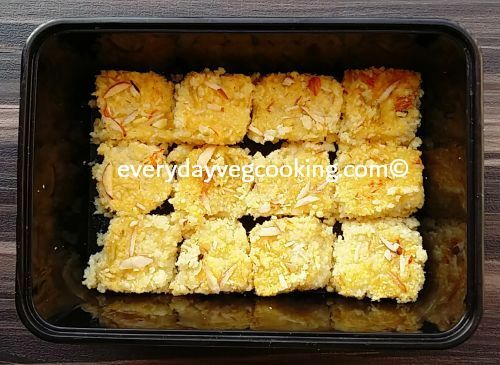 Let kesar kalakand cool completely. Refrigerate for 3 to 4 hours for it to set. After the kalakand sets, make cut marks and remove each piece gently to prevent it from breaking. Kesar kalakand is ready to serve. Kesar kalakand does not have a shelf life so store in the refrigerator and finish it within a week. 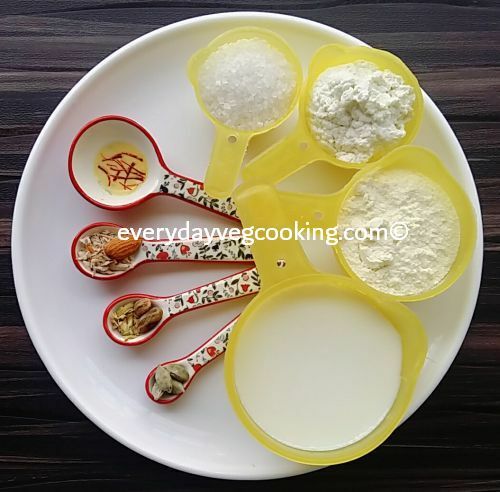 Glad to know that kesar kalakand is your favorite , recipe is also very simple and easy so please try to make . You do make the recipe look so simple! I would like to try this soon! Glad to know you liked this recipe .